If you sell through a network of channel partners and distributors you understand that keeping them updated on the latest sales pitch, product positioning or new features is a challenge. And it’s no surprise that they are missing a lot of your new training material because they have to navigate your website or search through your electronic catalogs. Or maybe you’ve got some material in your partner web portal, but they have to login to get to it. Why is that? The answer is simple: According to our research, your channel partners and distributors don’t know where to find this information. You need an easy way to get your sales and product information to your distributors right when they need it most — when they’re following up on a hot sales lead. Well, we’ve created just the tool for you. 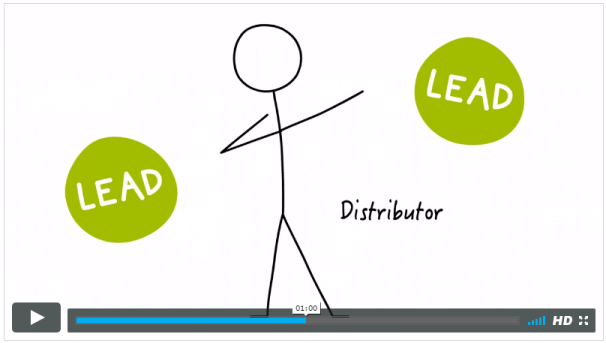 Introducing … Channel Sales Enablement, a core feature of the LeadMethod software platform. Here is a 2 minute video showing exactly how the system works. With LeadMethod your channel partners have the right information at the right time so they can close more deals. Request a demo of our Channel Sales Enablement feature or call us at 800-406-5020.